Mel Gibson. Bruce Spence. Vernon Wells. Emil Minty. Mike Preston. Action/Adventure. Violence. Cult. Science Fiction. Chases; Cars, buses, etc. Desert. 01 Nigel's Choice. Post Apocalyptic. Thriller. 01 Kelly's Heroes. Bikers/Cyclists. Recommended. Hearing Impaired (DVD). 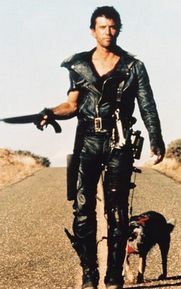 Easily the best of the Mad Max trio. In an apocolyptic post-nuclear war future, where violent scavengers dominate society, our hardened existential hero finds himself forced to side with the remnants of civilization in their desperate battle for survival.